I admire anyone who can take wrapping paper, scissors, and a couple pieces of tape and turn it into a work of art. My gift-wrapping skills tend to look more like a toddler’s or perhaps a Picasso. But when the folds and lines are clean, the corners crisply pointed, and the ribbon on top forms a perfect tornado of color, well then, there’s something special about a well-wrapped gift. Even eager children approach it slowly, almost reverently. With gentleness, they peel back one piece of tape, a corner here, a seem there; taking their time to unwrap the gift. In this we see a picture of God’s well-wrapped gifts to us, many of which take a life-time to unwrap. We see it in God’s gift of marriage and family. Month after month, year after year, anniversary after anniversary, husband and wife unwrap God’s gift of life together in their union. And a relationship that began as high school sweethearts, a blind date, or college friends, turns into more gifts: children, grandchildren, great-grandchildren. From an infant’s quivering chin to the first time they open their eyes. As they grow from infant to toddler, into preschool, elementary, teens, and young adults, God’s precious gift of life is unwrapped. I imagine Mary had many of those same thoughts as she gave birth to her firstborn son and wrapped him in swaddling cloths and laid him in a manger. As she treasured up all these things, pondering them in her heart. As she held in her arms God’s love wrapped in human flesh. That’s what Christmas is all about, after all. The unwrapping of the greatest Christmas gift of all. God sends us the well-wrapped gift of his only-begotten Son. He is, as Hebrews proclaims, the radiance of the glory of God yet wrapped in humility and bearing our humanity. He is the exact imprint of God’s nature – very God of very God - yet He is also true man, born of the substance of His mother in this age. True God. True man for you. The God who wrapped his glory in the burning bush, in the pillar of smoke and fire, and in the cloud of the tabernacle wraps himself in the temple of human flesh for you. The God who upholds the universe by the word of his power, squawks, squirms, and screams as an infant in Mary’s arms for you. The Word became flesh because that’s what we are. Flesh. We hurt and we hurt others. We suffer and we cause suffering. We are sinned against and we sin against others. And yet, the birth of Jesus is big enough to cover all our sin and death. In his birth and death for us he wraps himself in our hurt, pain, sorrow, suffering, shame, guilt and death, that we might be wrapped in his arms forever. The Word became flesh and dwelt among us. That means, God knows what it is to breath. To hunger and eat. To thirst and drink. To grow fingernails and hair. His beautiful feet have walked in our shoes. He knows what it is to live. To work. To rest. To be rejected and betrayed. To weep. To suffer. To die. All this he has done for you. By becoming man, He also took on everything that being human entails. He took onto His shoulders our sickness, grief, and pain. He bears our anger, our selfishness, our pride. He takes responsibility for our hatred, our lust, our murder. Jesus became flesh to bear the sins of our flesh. And the God who wrapped himself in our humanity still unwraps his gifts for us here. In the Word who became flesh, who dwells among us in the gifts of his body and blood. And who dwells among us in the neighbor whom we serve, as we unwrap God’s love for others. At Bethlehem, Mary wrapped her Son in swaddling clothes. At Calvary, He was unwrapped for us – stripped by Roman soldiers and nailed to the cross. Yet by this unwrapping, He has wrapped each of you in His own robe of righteousness. And he presents you to His Father as a well-wrapped gift. For… the Word became flesh and dwelt among us, and we have seen his glory, glory as of the only Son from the Father, full of grace and truth. When it comes to Christmas movies, it’s hard to pick a favorite. The whimsical Elf. The hilarious trials of Clark Griswold. Ralphy’s quest for the Red-Rider BB gun. But nothing tops Linus in Merry Christmas, Charlie Brown. In the world of Christmas movies, he’s my hero. For Linus points us to what Christmas is really all about. A humble tree and a simple message of Good News. 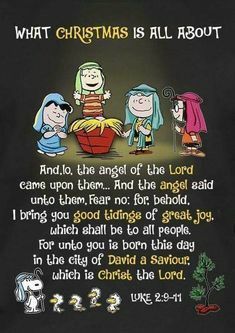 Unto you is born this day in the city of David, a Savior, which is Christ the Lord. Linus doesn’t tell us to skip the Christmas parties, throw out the presents, or toss the tree to the curb. He simply, yet with reverence and joy, reminds us that the Christmas story is not one story among others. This is thestory. The story of Jesus’ birth of us. The story of our Savior born to rescue, redeem, and restore us. The story of Good News of a great joy that is for all people; it is for you. Christ is born to save you. To live for you. To suffer, bleed, and die for you. To rise and live for you. We simply cannot hear this story enough. For without this story we would have no Christmas carols or Scriptures like Luke 2 to hear. Without this story we would have no presents, parties, or pageants. Without this story we would remain Charlie Brown trying to put together a Christmas play. We would be helpless, hopeless, and lost forever. Finally, Charlie Brown cries out, “Isn’t there anyone who can tell me what Christmas is all about?! He’s right. Christmas is about God’s promises through Isaiah, kept, fulfilled, and revealed in Jesus’ birth. Christmas is about Jesus who came to help the helpless by becoming a helpless child for us. Christmas is about Jesus who was born to bear our hopelessness, brokenness, sin and death from Bethlehem to Jerusalem, to cross for us. Christmas is about Jesus who comes to rescue and save poor miserable sinners as surely as he came to proclaim Good News to poor shepherds. Christmas is about Jesus who gave himself for us to redeem us from all lawlessness and to purify for himself a people for his own possession. Sermon for Christmas Eve Lessons and Carols: "A Story Behind Every Ornament"
A few weeks ago, shortly after the Christmas tree was put up here in the church, I was talking with one of our elders before Divine Service. We admired the tree; it’s beauty, it’s towering branches and, it’s fresh smell. But most of all the carefully crafted ornaments. “There’s a story behind every ornament”, he said. It’s true. Every ornament tells us a story. I know that’s true in our home, as I’m sure it is for many of you. A little crawling baby that tells us the story of someone’s first Christmas. A wooden sea star that tells the story of a joyful wedding. A sailboat that tells us the story of a loving grandpa and great-grandpa. Whether they’re big or small, fragile or cat and toddler-proof, old or new, simple or intricate, there’s a story behind every ornament. And if that’s true in our own homes, it’s all the more true of our Lord’s house, where the tree and all its ornaments point us to Jesus’ birth, life, death, and resurrection for us. The circle with the cross fixed to the top is the world covered by the cross, and it tells us the story of Genesis 3. Adam’s fall into sin which spread sin and death to all men. To us. But the free gift is not like the trespass. 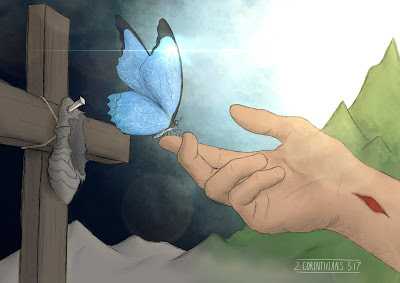 For if many died through one man's trespass, much more have the grace of God and the free gift by the grace of that one man Jesus Christ abounded for many.As in Adam we die, so in Christ we are made alive. The Lamb tells us the story of Genesis 22, how God spared Abraham’s son, his only son whom he loved by providing the sacrifice. And how God would not spare his own son but gave him up for us all. God provides the sacrifice in Jesus. Behold the Lamb of God who takes away the sin of the world. The crown of thorns tells us the story of Jesus from Isaiah 11. He is the root or shoot of Jesse, the righteous branch that sprouted from the stump of fallen Israel, and one day he will receive the twisted branches of thorns upon his head for you. In that day the root of Jesse, who shall stand as a signal for the peoples—of him shall the nations inquire, and his resting place shall be glorious. The manger tells us the Christmas story of Luke 2, just as the angels proclaimed to the shepherds. Fear not: for, behold, I bring you good tidings of great joy, which shall be to all people. The angels on the tree tell us the story in a song that unites heaven and earth. Glory to God in the highest, and on earth peace, good will toward men. The stars upon the tree tell us the story of the Magi who were led by the light of the star to him who is God of God, Light of light, a lamp unfailing and the very Light of the world in human flesh for you and has brought us from the kingdom of darkness to his marvelous, everlasting light. The cross and the chalice tell us the story of John 1, that Jesus the Word became flesh and dwelt among usin the crib, on the cross, and in the chalice with his body and blood given and shed for you. Yes, there’s a story behind every ornament. It is the greatest story of all, for it is the story to which all these ornaments point. It is the story to which all stories in the Scriptures point us. It is the story the angels sang to the shepherds, and that we join in singing and rejoicing in tonight. It is the one true and meaningful story of the greatest ornament ever to be placed on a tree. Not a noble, douglas, or grand fir, but the humble tree of the cross, adorned with the greatest ornament of all: Jesus crucified for you. Third Midweek Advent Sermon: "Jesus' Advent Future"
Wouldn’t it be great... if that new car we bought didn’t lose its value as soon as we drive it off the lot? ...if the latest and greatest iphone or gadget wasn't already out of date the moment we bought it? If our favorite toy didn’t run out of batteries or break? If our knees, hips, and shoulders - or even their replacement didn’t wear out eventually? “Oh well, that’s just the way it is,” we say. Except it wasn't always that way. Something has gone terribly wrong. Things break, rot, rust, decay, and die. Life isn’t supposed to be this way. The creation God once declared “very good” is full of terrible, horrible, no good, very bad days. And so we long for healing. Rest. Peace. Reconciliation. We long for everything to be right again. For the mended world. We long for something new that will stay new. And this is exactly what our Lord promises in Jesus’ advent yet to come. Sadly, for many Christians, Jesus’ advent yet to come causes panic, dread, and despair instead of the peace, comfort, consolation, and rescue Jesus comes to bring. So, whenever the End Times comes up, here’s a few quick questions you can ask yourself anytime you hear someone talking about Jesus’ return. Does it point you to Jesus’ promises or away from Jesus’ promises? Does it focus on Jesus’ word and works for you or man’s word and works? Does it give you comfort in Jesus crucified, risen, ascended, and returning or does it cause you fear, anxiety, and despair? Panicked and afraid, that’s where we find Scrooge near the end of A Christmas Carol as he is met by the spirit of Christmas yet to come. This third messenger - a cold, dark, shadowy, phantom - stretches out his black-robed hand leads Scrooge onward. Pointing him to a sick, lonely, dying man lying on a bed. To a man’s wealth being plundered in death. And finally, to the cold neglected grave of a man who died alone. Though this 3rd visitor never speaks a word, he reveals Scrooge’s brokenness. God’s Word comes to us in the same way, like the magic mirror in Snow White, only it reveals not our beauty, but the ugliness of our sin. For the wages of sin is death. And, as book of Hebrews says, we are held captive in slavery by the fear of death. This is what sin does, causes us fear, doubt, pain, suffering, sorrow, and finally death. No wonder Scrooge was surprised when he woke up the next morning. He didn’t know what day it was. He only knew, to his astonishment, that he did not get what he deserved, earned, or expected. Just the opposite in fact. Christmas changed everything for Scrooge, his past, present, and future – all made new by Christmas. He was no longer a greedy, grumpy, old miser. Now he was generous, joyful, and caring: a prize turkey for Bob Cratchit. A surprise visit to his nephew for dinner. Gifts of charity and joyful greetings. He simply couldn’t contain his joy. He was given new birth, a new creation. “I am quite a new baby” he rejoiced! The same is true for us too. Christmas changes everything. The birth of Christ for us changes our past, present, and future. In Jesus’ advent past our sins are wiped away, blotted out, covered, cancelled, forgiven; you are redeemed, rescued, and restored. In Jesus’ advent present he comes to us, dwells with us, loves, heals, forgives, restores, and cleanses us, and calls us his children of the heavenly Father. In Jesus’ advent future we dwell safe and secure in the wounds and work of Jesus on the cross. For Jesus’ advent past set the end of the world in motion. In Bethlehem the judge of the world arrived on the scene, but not as we expect. The face of our judge has a face, arms, and legs like us. His face will bear the blows we deserved. His feet will walk in the ways of the Lord for us. His arms will be stretched out to bear our judgment. For in Jesus our judgment day has already come. It has taken place in his own body on the cross. Jesus has borne it all for you. The world begins to turn on its hinges in Jesus’ crib and cross. The one who comes to judge the living and the dead is judged for all, in our place…to save us all from Satan’s power when we had gone astray. Like Scrooge we did not deserve, earn, or expect this. And yet Christmas morning comes to change us all. Behold, I am making all things new, declares our Lord. Christ’s birth changes everything for us, as it did for Scrooge. And so does Jesus’ life, death, resurrection, and glorious return. On that Last Day we need not fear or despair. Christ has died. Christ has risen. Christ will come again. In Jesus’ advent future, he’ll call us from our graves and we’ll awaken to the resurrection like Scrooge on Christmas Day. Full of joy and new life, a new creation. Indeed, in Jesus’ advent God has blessed us, every one! In December of 1914 the Great War had been raging across Western Europe for several months. 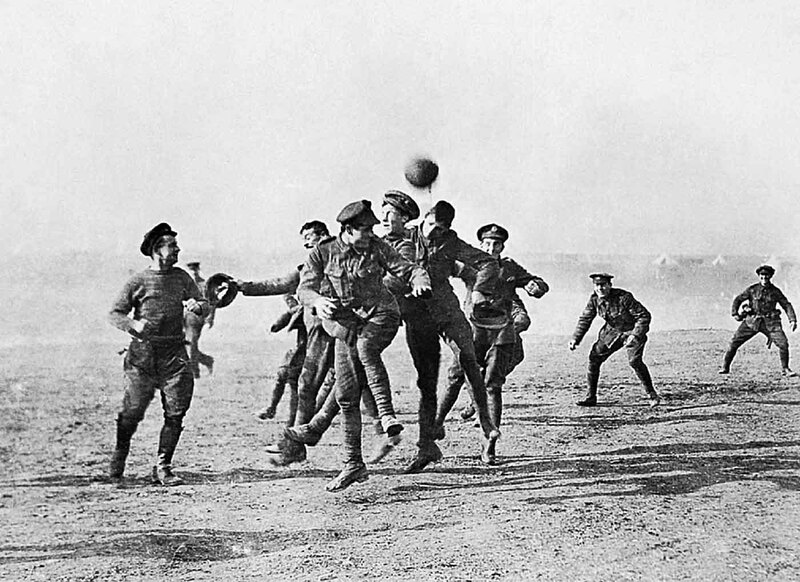 But that Christmas Eve of 1914, something strange happened along parts of the Western Front. Guns fell silent. Officers swallowed their trench whistles. Shells ceased their banshee cries. And in the silence, music filled the air. German soldiers sang Silent Night. British troops responded with The First Noel. No man’s land became a soccer field. Some soldiers even exchanged gifts. They realized that there was something far greater than past hostilities. That there was something hopeful, far beyond the bleak future of their muddy trenches. Joy in Jesus who came and who still comes among us. Joy in Jesus who was born to die for us. Joy in Jesus’ advent present. For few hours, Christmas came and interrupted everything they thought important. For a moment that present moment was all there was. That’s what Christmas does. Jesus’ birth is God’s great, joyful interruption into the darkness of sin and death. Jesus invades his fallen creation with grace, mercy, and peace in his life and death. Jesus’ birth leads to his death, to the cross where he fought for us the war to end our war against God. No wonder the angel army proclaimed a jubilant song, Glory to God in the highest! And on earth, peace among those with whom he is pleased. And yet, we do not celebrate Christmas simply because Jesus is the God who came to save us – past tense; but also because he is the God whocomesto save us – present tense. As the angel of the Lord told Joseph. Jesus is our Emmanuel. God with us. Yet not in the consuming fire of the burning bush. Not in his untouchable glory as in the Tabernacle. Not even in the radiancy and brilliant light of his transfiguration. God with us as a zygote in The Virgin’s womb. God with us in our flesh and blood and bone. God with us in his hiddenness and humility in ordinary words, water, bread and wine. Like Scrooge, though, we have a problem with humility. As C.S. Lewis writes, humility isn’t that we think less of ourselves, but that we think of ourselves less. That we stop navel-gazing and look to our neighbor’s needs. That we live in sacrificial love for those God places in our lives. And like Scrooge, we have not done this. Our sin, like his greed, spreads misery and pain everywhere we go; it infects everything we say, do, and think. As we confess on Sunday mornings. We have not loved the Lord with all our heart, soul, and mind; we have not loved our neighbors as ourselves. The second spirit in A Christmas Carolwas the opposite of everything Scrooge was. He was a miserly, self-absorbed curmudgeon. The spirit of Christmas Present was full of mirth, life and laughter, sprinkling joy everywhere he went. He took Scrooge all over the country showing, to show him his own want and need, but revealing great joy in humility: miners huddled around a fire, sailors at sea, Bob Cratchit and his family, his Nephew and his wife – all of them living in poverty, yet celebrating Christmas with great joy. Having nothing they rejoiced that they had everything in Christmas. That is why the joy of Christmas isn’t found in some abstract, nameless, lifeless, wishy-washy “Christmas spirit”, but in Jesus’ Advent present for us. Jesus who is Emmanuel. God with us. God with us in life and death. God with us in joy and sorrow. God with us in calm and strife. God with us in contentment and anxiety. God with us in health and sickness. God with us in trust and in doubt. God with us in times of peace and pain. God with us in our laughter and our weeping. God with us on the cross, in the grave, and in His resurrection in which we are baptized. God with us in his humble words that transform simple water into a flood of forgiveness. God with us in his humble words that cause ordinary bread and wine to host a Christmas feast of his body and blood. You shall call his name Jesus, for he will save his people from their sins.This is why Jesus came. For you. To fix what we had broken. To mend what was marred. To find us who were lost. To save us who were perishing. To be our Emmanuel. God with us. Not only in the past. But here. Even now. Today. His name is Jesus for he has saved you from your sin in his advent past. He will save you from your sin in his advent future. And he saves you in his advent present. God bless us, everyone, in Jesus’ advent present. In Emmanuel – God with us and for us.